Under Armour reported third-quarter earnings that beat on the bottom line but missed on the top line. The company also raised its full-year earnings guidance. Shares rallied 10% before Tuesday's opening bell. 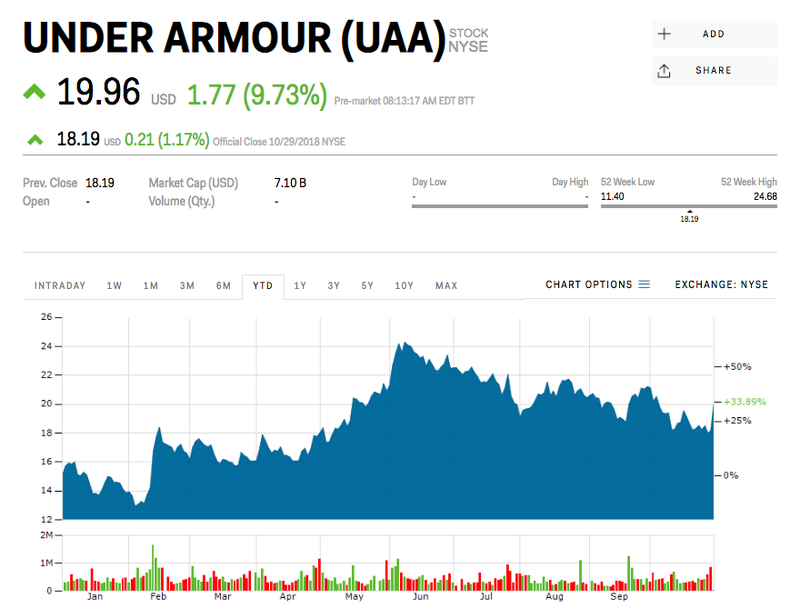 Under Armour is rallying before Tuesday's opening bell — up 10% — after the company beat on third-quarter profits and raised its full-year guidance. The sporting-apparel maker earned an adjusted $0.25 a share — $0.12 higher than what analysts surveyed by Bloomberg were expecting. Revenue was $1.4 billion, just missing the $1.42 billion that was anticipated. "Our third quarter results demonstrate that our multi-year transformation is on track," said CEO Kevin Plank in a press release. "As we work through this chapter, we are staying sharply focused on our brand by connecting even more deeply with our consumers while delivering industry-leading, innovative products and premium experiences. Coupled with increasingly greater business discipline and resulting efficiencies, we continue to gain confidence in our long-term path and ability to deliver for our consumers, customers and shareholders." Looking ahead, the company lifted its full-year guidance and now sees adjusted earnings per share to be in the range of $0.19 to $0.22, up from the previous expectation of $0.16 to $0.19. The adjusted earnings and guidance have excluded the impact of both restructuring and the US Tax Cuts and Jobs Act, according to the company. Under Armour shares have been under pressure over the past few years, tumbling as much as 79% from their September 2015 peak. They bottomed out in the second half of 2017, when the company was having issues getting its inventory under control. Since then, the athletic brand has undertaken an ambitious its restructuring plan, which has included cutting more than 500 jobs in 2018. Shares were up 20% this year through Monday.